This article about the Opening of the new Drawing Room at Smedleys Hydro, Matlock, was transcribed from a copy of The High Peak News dated 23 June 1888. Some images have been added. The article is long and starts on a low note, but works up to a crescendo, making the reader realize what an amazing place Smedley's Hydro was. 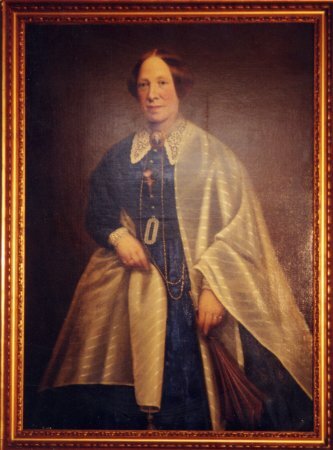 Missing 9 ft portraits:Found in Lea Mills? 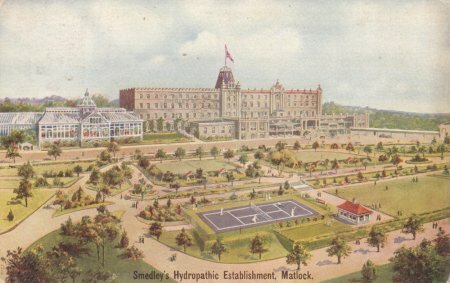 Since the introduction of Hydropathy into Matlock by the late Mr John Smedley, it has developed as rapidly as any of the acquired sciences; but at no place has the water cure system gone through more varied changes than at the "Home" of this beneficial treatment. From the humble cottage situate on Matlock Bank, where the genius of John Smedley laid the nucleus of the famous institution which has his name for its powerful attraction, and his principles of comfort and convenience for its aim, no greater transformation has taken place amongst the hundreds of establishments which have originated from his ideas than at the sanatorium which carries on the universal hygienic business under his world-known title. Smedley's at Matlock Bank has "mended its ways" indeed. Within its walls is sufficient splendour to make the most fastidious lead happy lives. Colonel Burnaby, in his "Ride to Khiva", relates that he saw over a Russian tavern door the enticing invitation "get drunk and be happy, all for a penny". At Smedley's you have a distinct advantage over this; you can, and must, keep sober, and be thoroughly merry - well, not gratis, but for a moderate sum. The doors are open as freely to the artisan as the millionaire. It has sheltered foreign potentates, distinguished noblemen in diplomacy and statecraft, and the noblest and grandest have honoured it with their presence. The visitors' book is a gazetteer which includes patients from Australia, China, India, America, and all parts of Europe. The history of Hydropathy is not yet penned. When it is the potent name which formed the most interesting annal of this system of physiological treatment will be inscribed in the contents. 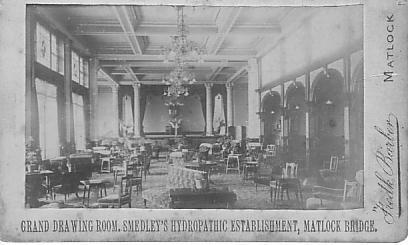 John Smedley is incomparably associated with hydropathy, and to his experiences and experiments some parts of Derbyshire owe very much of its prosperity, and thousands will concede they have been relieved from suffering. It is said that water was the sole article in the pharmacopoeia of Napoleon I. The great Corsican is reputed to have thus addressed an Italian physician: "Believe me, we had better leave off all those remedies. Life is a fortress which neither you nor I know anything about. Why throw obstacles in the way of its defences? Its own means are superior to all the apparatus of your laboratories." Napoleon, then, believed in water when he referred to nature's means as superior to physic. Hydropathy is growing in favour in all parts of England. Ample evidence of this association is found in the new hydros which are opened on every side. The medical faculty do not, as a rule, hold it to be a slow and certain slayer, as they did years ago. Dr. F.Armstrong, in the Medical Commentaries, years ago, wrote: "I have taken great pain to examine particularly into the properties of the Matlock springs, and may with truth assert that they are of the same nature with the Bristol water, equal in some cases and preferable in many." Again he adds: "I have, in the course of seven years, sent a great number of patients to Matlock, and in cases where medicine had not the least prospect of being serviceable: all of whom have had perfect and lasting cures; and may with truth declare I have not failed in one instance." He afterwards observes: "I perfectly agree with Dr. Percival, that a larger quantity of Matlock water may be drunk at a time than any other mineral water I am acquainted with, owing to the entire absence of any mineral spirit; yet it is always advisable to begin with small quantities. From the want of mineral spirit it is less apt to throw the circulation of the blood into irregularities, or quicken the pulse; and therefore it must have the preference. to Bristol water in phthisis, pulmonalis, haemoptor, diabetes, fluor albus &c. In all those I have experienced the most happy effects from it, as well as in hysteric and hypochondriac affections, profluvium, or deficiency of catemenia, in bilious disorders, in constitutions debilitated by long and severe vernal and autumnal intermittents, in disorders arising from long residence in hot climates, in broken constitutions brought on by hard and habitual drinking, and in weak and depraved appetites." There are numerous other treatises which deal with Matlock water as a corrective for many ailments. It is not merely in the warm months that Matlock is in request to invalids and those who are disappointed of the advantages of a more genial climate in the Sunny South. In winter it is equally favourable. The place is effectually sheltered from cold winds by the nature of its situation. The growth of Smedley's institution is without rival. The late philanthropist commenced in an ordinary cottage. He had no medical education, but had long studied human physiology. The more he pondered over this subject the more convinced he became of the inexpediency of bleeding, cupping, and the other drastic remedies these employed. He commenced in a house fitted to accommodate six persons. The numbers gradually increased to about 1,600 per annum, and in 1867 they had reached 2,000. At this number the patients remained for some years, owing to want of accommodation. In 1867 so many persons were refused admission that Mr Smedley decided upon the erection of a new and commodious building. It was completed a year later, the engineer, architect and clerk of the works being Mr Smedley himself. Then the patients rose to 2,500 per annum. During this time the whole responsibility was upon Mr Smedley. His patients were scattered all over the world, and with them he had correspondence. Besides, he advised upon every case, and was at business by five o'clock every morning. The strain was too heavy, and he became anxious to secure the services of a medical gentleman to relieve him of the personal supervision of cases. 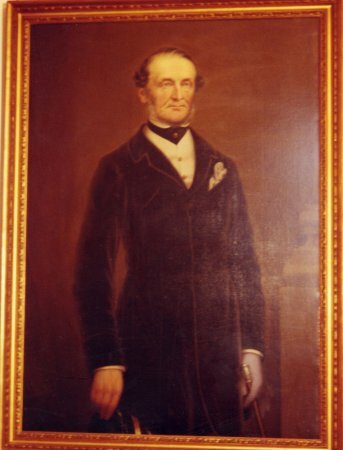 It was not until 1872 that Dr. W.B.Hunter was met with. To him was given the sole charge of the medical department. The choice was judiciously made, and the name of Dr. Hunter is as popular as any specialist of the day. To him Smedley's is largely indebted for its present renown. In 1875 the institution as acquired by a limited company, with a capital of £50,000. Probably over 3,000 cases are dealt with annually, and with the increased accommodation these numbers will be exceeded in future. The establishment is fitted with all the modern appliances for bathing, cooking, and every comfort which human foresight can discover. There are extensive pleasure gardens, tennis lawns, skating rinks &c, &c. When the premises came into the possession of the present company steps were at once taken to improve and enlarge them. It was decided to do the work in four sections. The first was commenced in January 1881, and included a spacious entrance hall, grand staircase, bedrooms, reception rooms, lavatories, secretary's office, and other rooms. The entire cost was placed at £30,000, and the style adopted that of the Queen Anne period. The whole of the woodwork is American walnut, interspersed with oak. An elaborate dado of walnut runs around the walls, the upper parts being effectively covered with lincrusta walton. At the south end of the hall is a memorial window to the late Mr. Smedley. It was erected by public subscription, and contains over 300 square feet of glass, the cost being about £350. The symbolical figures are: In the centre, Truth seated in a well holding her symbols, a glass of water and a mirror; to the left a figure of Hygeia, and to the right one of Aesculapius. The second section was begun in 1884, and comprises dining-hall, bedrooms, and a lofty corridor, 100 feet in length, connecting the east and west "wings". The dining-hall is most ornately designed, and is 90 ft by 45 ft, the roof resting upon twenty eight Corinthian pillars. It has accommodation for 350 guests. This section cost £10,000, making an immense improvement. The third section was commenced in October of 1886. It consisted of the main front of the building, looking over the valley in the direction of Masson and Matlock Bath. The facade is designed in Italian renaissance style, very freely treated. The effect is very imposing and elegant, both internally and externally. The new drawing room is 95 ft long, 45 ft wide and 22 ft high. The roof is constructed of iron concrete, and forms a promenade. Besides twenty-eight bedrooms are added in this block, recreation room, 80 ft by 30 ft; private dining room, 27 ft by 18 ft; ladies' and gentlemen's cloak and ante rooms; matron's and manager's offices. It is more particularly with this new portion we have to deal. As we have stated, in October 1886, a contract was let to Mr L.J.Wildgoose, of Matlock, for the construction of the third block of buildings. The plans were prepared by Mr G.E.Statham, architect, of Nottingham and Matlock, as were all the other designs for the company. The actual figures for the masonry were £5107, and, of course the extras increased the sum. The woodwork was undertaken by Messrs. Moore Brothers of Rawtenstall at a cost of £2924, and the furnishing and decorating was placed in the hands of Messrs. Foster and Cooper, of Nottingham. Of the capabilities of these firms nothing need be said. They have executed the work in the most finished style, and Smedleys will serve as a reference for them, which, for general excellence, cannot be excelled. To give a description of the new drawing room is a task of no ordinary character. It is superb and perfect. The opinion obtains that the room is second to none in any semi-private place in the country. At one end is a permanent stage, 20 ft deep and 20 ft wide, with ante-rooms. It is flanked by Corinthian columns and pilasters. The stage is as large as those in most of the leading theatres. All the architectural work is of free classic style, from the plans of Mr Statham. This magnificent room is elaborately decorated and furnished in artistic taste. There are six recesses on one side. These are arranged to give a sight of the great hills to the west and south. The seats are upholstered in electric blue frieze velvet, tastefully draped with velvet curtains. The woodwork is richly carved, and the seats are fixed for a view of almost the entire room. In one of these recesses is a beautifully carved mantelpiece of exquisite design. opposite the recesses are six spacious windows, with fanlights above. The windows are of costly stained glass, the centre panels of which are figures representing the Muses. One of the features of this elegant apartment is the embroidered blinds, which give an artistic effect and splendour to the rest of the room. The window curtains are also of the richest velvet. The woodwork is chastely decorated. The doors, the recesses, and the windows are done in solid walnut, all finely carved. The dado is of Japanese paper, whilst the middle part is an ordinary rich blue paper, with a handsome fringe running round the top. The floor is covered with a carpet which has been specially manufactured for Messrs. Foster and Cooper, in Bohemia. It is about one ton in weight, and is made entirely by hand, by skilled people, and can scarcely be said to wear out. The splendid thickness and softness of the pile makes it like walking upon moss. It is luxurious and costly, and fits exactly in every part, like one immense piece, though on account of the great weight it was necessary to have several sections. The settles, ottomans, and chairs have been specially designed and constructed so as to take apart and form in line for entertainments. 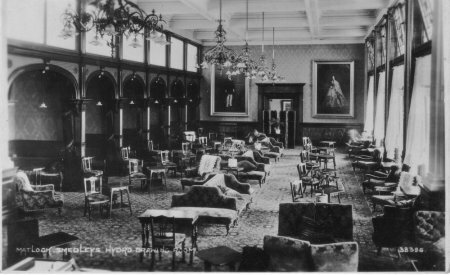 Grand Drawing Room looking South East, taken about 1910. The colours are various, principally the electric blue and old gold. There are centre tables, card tables, all made en suite. The roof is most delicately and prettily decorated with cream and gold, interspersed with terra cotta and light blue. To say the room is immensely rich does not convey an idea of the exceeding beauty contained within the four walls. Messrs. Foster and Cooper have more than pleased the directors and the architect with their workmanship. Along with the furnishing of 20 bedrooms Mr C.E. Hughes took the contract on their behalf for the whole of the important work. There is another important innovation to be noticed at Smedley's. 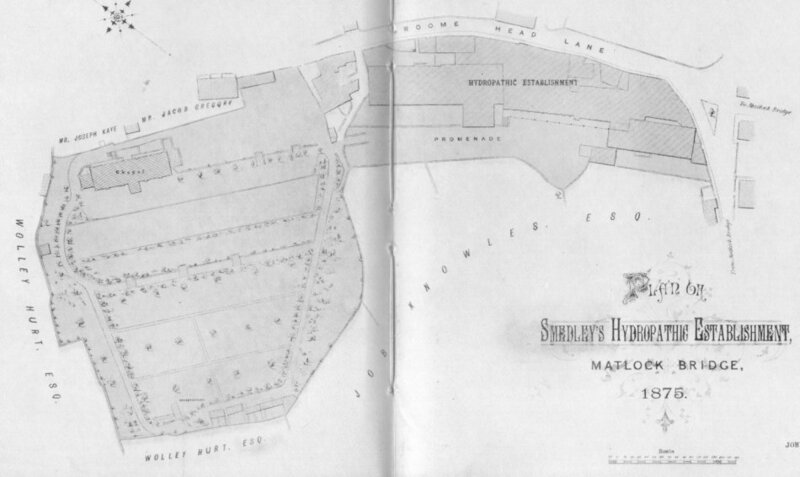 Messrs. J.H.Holmes and Co., of Newcastle, have laid apparatus for electric lighting throughout the place. The system is the Swan incandescent. There will be 350 lights, but the directors have wisely not dispensed with gas. In the event of any mishap the gas can be used as previously. Mr W.B. Askew, of Matlock, is erecting an engine house near the laundries, on the road side opposite the central block. The cost is estimated at about £1,500. When the corridors, offices, and rooms are illuminated with electricity the effect will be charming. At present the engine is not fixed, but the whole of the other appliances are ready. 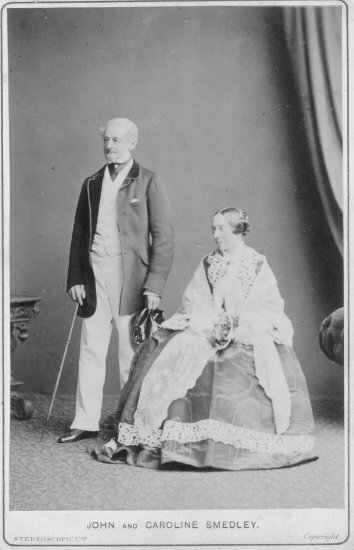 The company's architect Mr G.E.Statham, may be warmly congratulated on his admirable schemes and the methodical manner in which they have been carried into effect. The comfort of visitors has scarcely been interfered with, and this is a consideration when not less than 100 patients are staying there at once. Mr W.Doxey has been the clerk of the works from the first commencement. He has spent the last 30 years, with the exception of short intervals, in the service of Mr Smedley and the present proprietors. Under his direction the premises were heated with steam. We cannot omit to mention the arduous duties of Mr A.H. Douglas, the manager, who holds a very responsible position. He is courteous and obliging, and has the interests of the gigantic concern in his care. Along with the matron, he has to regulate the establishment and the large staff of over 150 servants. Subsequently the company adjourned to the drawing room, when a grand concert was given. The performers comprised the principal soloists from the Buxton Pavilion Band, with Herr Hermann Kiel as leader, and Mr Evelyn Timmins, Matlock Bath, as conductor. Mr J.G. Barker, A.C.O. accompanied the songs with taste and skill. Miss Edith Bryan, Matlock Bath, was announced to sing "Our Last Waltz", but through indisposition she was unable to attend. A lady visitor took her place, and sang "My Daring Heart" with pleasing effect. Mr Charles Conriney gave "Gallants of England" in a powerful, rich voice. The programme, which was arranged with excellent taste, included the overture "Zampa"; valse "Les Patineurs"; intermezzo "Forget-me-not"; selection "Mikado"; cornet solo "Lost Chord"; xylophone solo (encored); and the march "Gamorra". The concert was enjoyed most thoroughly, and its only fault was that of being terminated too soon. At considerable cost the directors had engaged the band, which gave every possible satisfaction. In the evening a grand ball was given in the dining hall, Mr J.H. Barnes' orchestral band being entrusted with the important engagement. The music they supplied was of the newest description, and gave complete satisfaction to the large and fashionable company which assembled. The programme was as follows: Valse "Les Sourires"; quadrille "Welcome Friends"; polka "Tres Gai"; valse "Mirage"; lancers "Ruddigore"; schottische "Dorothy"; valse "Love's Dreamland"; quadrille "Merry songs"; valse "Saionara"; valse "The Old Guard"; polka "En Foret"; lancers "Jolly Life"; valse "Soiree D'Ete"; valse "Sympathy". The success of Smedley's seems phenomenal, as year by year the visitors increase with the comforts of the colossal structure. There is yet another section to build, but this may be some time before it is put in hand. The buildings alone cover one and a half acres. It need not be added the treatment here obtained is of the most perfect description, the diet varied and judicious, and nothing remains to enhance the charms of the establishment. Deciphered, transcribed, compiled, indexed, formatted and copyright © 2006, . All Rights Reserved.